Join us for the biggest fishing party in the Northeast! Trophies & Awards • The Cow Gallery • Fishy Exhibits & Much More! Yamaha Marine • The Black Dog • Lowrance & Simrad Electronics • Dexter • & More! 1:30 – Captain Brian Patterson – Lowrance & Northcoast Pro Staff: How to use your electronics to find and catch monster striped bass from your boat! 2:30 – Roy Leva – Shimano Pro Staff: Fishing the Cape Cod Canal – Roy uncovers his tips, techniques and tackle he uses to catch stripers in the big ditch! 3:30 – Captain Blaine Anderson -Shimano Experience Team Manager: Captain Anderson will cover the tactics and tackle needed to catch big striped bass from your boat. Blaine is recognized as having released one of the largest documented striped bass ever! StriperFest is the biggest fishing party on the East Coast. 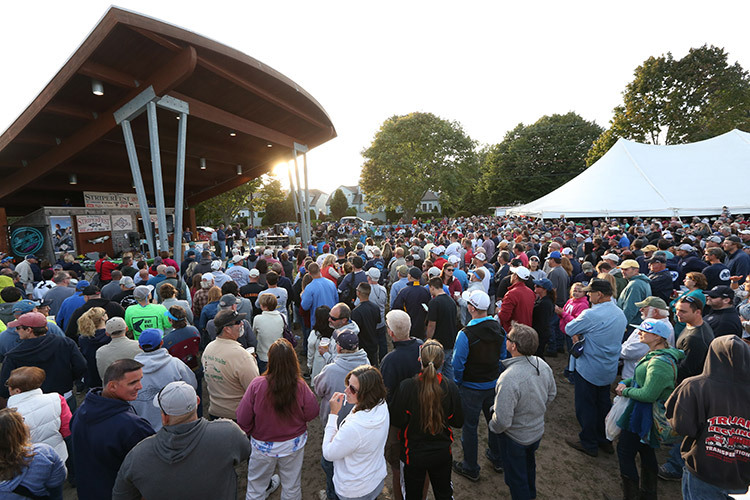 Over a late summer weekend, thousands of fishermen and their friends and family come to Cape Cod to take boat demo rides, check out the sponsors’ displays, eat, drink and enjoy live music. Way more than just an awards ceremony for The Striper Cup, it’s the season-capping event of the year for striped bass fishermen. StriperFest is held in On The Water’s hometown: the historic Cape Cod town of Falmouth, MA. Located right on Vineyard Sound, it’s the perfect location to celebrate a great season of fishing for striped bass and party on the waterfront at Falmouth Harbor. The Upper Cape is surrounded by world-class fall fishing, so don’t forget to bring your gear and plan to stay awhile. Falmouth offers something for the whole family, with great shopping, dining and nightlife. Take the ferry from Falmouth Harbor to Martha’s Vineyard, or check out the aquarium at nearby Woods Hole. Mark your calendars now for a fun-filled weekend! Go over the Bourne Bridge, which crosses the Cape Cod Canal. In the rotary after the bridge, take the second exit, Rt. 28 South. Continue straight on Rt. 28S for approx. 13.8 miles. Rt. 28 will take a sharp left at Queens Buyway, which brings you into downtown Falmouth. Continue on Rt. 28 for 1.3 miles, and take a right onto Scranton Ave. (just after the 7-Eleven). Marine Park will be on your left after .3 miles, on the waterfront. Look for the tents! Free parking parking available at the Gus Canty Community Center and the Falmouth Plaza (free shuttle provided). Premium parking is also available for $10 at the StriperFest lot on Scranton Ave. across from Robbins Rd. Please don’t park in front of Windfall Market, West Marine, or any of the side streets adjacent to Marine Park! There is no parking at MacDougalls’. For the sixth year in a row, Yamaha will be holding demo tours for a number of their new models. Just sign up at the Yamaha display inside StriperFest and walk down to the docks to enjoy a free demo ride out into Vineyard Sound! Make Your Plans Now for a Weekend Getaway! Boat Fishing: Martha’s Vineyard, Nantucket and the Elizabeth Islands are all within an hour run and offer superb fishing. False albacore are often abundant at this time of year just outside Falmouth Harbor. Cape Cod Bay also offers small-boat owners a shot at bluefin tuna. If you have a large boat, there are plenty of slips available in Falmouth Harbor that are within walking distance from the event. Nearby Boat Ramps: Falmouth Harbor, Green Pond, Woods Hole, Sandwich Marina. Shore Fishing: Cape Cod Canal, Nobska Point, South Cape Beach, the Falmouth beaches. There is plenty of beach access, and all beach lots are open to the public in the off-season, no fees required. The Melanoma Foundation of New England (MFNE) is excited to partner with this year’s StriperFest. Founded in 1999, the mission of MFNE is to reduce the incidence of melanoma in the New England region. Did you know that Caucasian men over 50 have the highest mortality rate from melanoma and the majority of melanomas if caught early can be cured? Early detection is the key. MFNE works to increase awareness that regular skin exams by your healthcare professional can prevent many of these melanomas. So don’t wait, make your annual skin check appointment today and stop by our booth at StriperFest 2019!